With this lens adapter, you can mount Canon EOS Lens Mount Lens on M4/3 MFT Olympus PEN and Panasonic Lumix Cameras; It is compatible with: Olympus PEN E-P1 P2 P3 P5 E-PL1 PL1s PL2 PL3 PL5 PL6 E-PM1 PM2 OM-D E-M5 E-M1 EM-P1 EM-P2 EMD, Panasonic Lumix DMC-GH1 GH2 GH3 GX7 G1 G2 G10 G3 G5 G6 GF1 GF2 GF3 GF5 GF6 GX1 GX2. There are no electrical contacts in the adapter ring. Exposure and focus has to be adjusted manually; Auto focus (AF) is not available. Focus infinity in manually. This fabulous adapter can enable the camera owners to increase the cameras’ magnification and working distance. With precise design and high technology.Made of brass and aluminum (not plastic); Smooth surface for effortless mount; Anodized aluminum construction. • With this new advanced lens adapter, you can mount Canon EOS mount lens on M4/3 MFT Olympus PEN and Panasonic Lumix Mount camera body. • Certain prime lens just can’t be replaced, and you save the cost of purchase on new lenses. • The K&F Concept lens mount adapter is made with high standard precision. • It’s all metal design and polished surface is designed to guarantee smooth mounting and long lasting experiences. 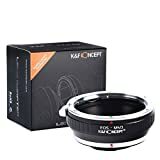 • The K&F Concept EOS-M4/3 Lens adapter allows you to place your favorite Canon EOS Lens on your Micro 4/3 M4/3 camera body. • This adapter gives you the ability to use your irreplaceable prime lens and saves you the cost of purchasing new lenses. “release the shutter the lens is not installed”, you can modify the settings to allow. Specifically refer to the camera manual. This entry was posted in Discount Photography and tagged Adapter, AdapterK&F, Cameras, Canon, Concept, EOSM4/3, lens, Lumix, M4/3, Micro, Mount, Olympus, Panasonic by Ball Photo. Bookmark the permalink.